If you've been itching for more Don't Starve content, Klei Entertainment has just added some dark, dank caves for you to explore in an update today. 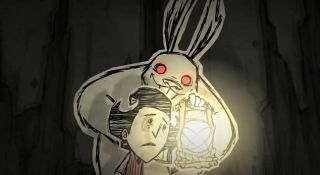 According to Klei's blog post , you should find at least one cave entrance on the survival maps you played before the update , where you'll discover spiders, bats, and bunnies that just want to welcome you to the neighborhood – with their teeth. You might, however, have better luck finding your underground pals in a newly generated map, which is supposed to have additional entrances to the caverns below. Alongside the completely friendly, non-homicidal cave critters are some new controls to help make inventory management a little easier. Also, the NPC characters Abigail and Chester will no longer trigger any nasty traps. They could probably teach that useful skill to the other characters, but, you know, survival of the fittest and all that. But before you go off spelunking for scraps of food, you should know that this is just the first in a series of updates, and there's a chance you'll find the non-creepy crawly kind of bugs during your stay in Don't Starve's underworld. Klei has said it's looking to squash those bugs while adding new monsters and objects in three or four additional updates. We'll be stocking up on torches and poisoned carrots in the meantime. You know, the essential camping gear.